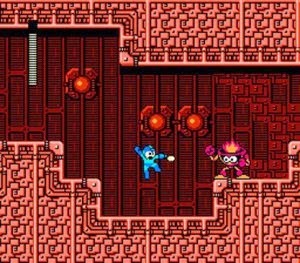 Arriving just a year after the original, Mega Man 2 added a number of gameplay enhancements that have remained throughout the rest of the series. Right from the start it's clear that the production values have been stepped up with a cool intro scene and messages from Dr. Light when you finish each level. The graphics have also been improved with more background detail and better animation in the enemies / Robot Masters. There are now eight Robot Masters to defeat compared to the originals six and each stage has tons of variety in terms of environment, enemies and obstacles. The franchise is known for its punishing gameplay but thankfully a 'Normal' difficulty mode was added to the North American release that essentially makes enemies weaker. This is a game changer as it allows less experienced players to progress further into the game and improve their skills as they go. You'll still encounter some cheap hits that the series is notorious for but this mode helps to lessen the frustration. What I love most about Mega Man 2 is that there are so many different ways to tackle each level. Do you risk jumping across a series of disappearing platforms or use your jet to wizz past the entire section? Do you take the easy route through an area or use a platform item to reach a tougher, higher route that has extra 1-ups and energy replenishments? Because the game constantly forces you to think ahead it has massive replay value. The soundtrack is top notch and is without doubt some of the best music you'll find on the NES. Each track is a massive step up from the functional ones found in the original Mega Man, and they really help to keep the action tense, especially in the later Wily stages. Speaking of which, there are some great bosses towards the end of the game including a dragon that's very similar to one found in Little Samson (NES) which was developed by ex-Capcom employees in 1992! Mega Man 2 is a fantastic game all-round. Considering the development team worked on this title in their spare time it's a remarkable achievement and it comes across as a real labour of love. This is a classic NES game that has aged extremely well and it should be experienced by anyone that loves the action / platformer genre. Random trivia: While Japanese gamers got to experience Mega Man 2 in December 1988, unlucky European gamers had a long wait as the title wasn't released in PAL regions until January 1991. Sadly, that wasn't an uncommon thing in the 8-bit and 16-bit eras!